Haplotype assembly is the computational problem of reconstructing the two parental copies, called haplotypes, of each chromosome starting from sequencing reads, called fragments, possibly affected by sequencing errors. Minimum Error Correction (MEC) is a prominent computational problem for haplotype assembly and, given a set of fragments, aims at reconstructing the two haplotypes by applying the minimum number of base corrections. By using novel combinatorial properties of MEC instances, we are able to provide new results on the fixed-parameter tractability and approximability of MEC. In particular, we show that MEC is in FPT when parameterized by the number of corrections, and, on “gapless” instances, it is in FPT also when parameterized by the length of the fragments, whereas the result known in literature forces the reconstruction of complementary haplotypes. Then, we show that MEC cannot be approximated within any constant factor while it is approximable within factor O(log nm) where nm is the size of the input. 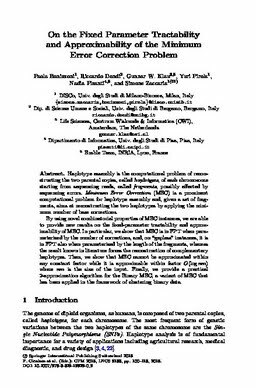 Finally, we provide a practical 2-approximation algorithm for the Binary MEC, a variant of MEC that has been applied in the framework of clustering binary data.